Since the collapse of Japan’s bubble economy in the early 1990s, and the fitful efforts at political and economic reforms that followed, it has become almost customary among many observers to see Japan as a nation paralyzed by an inability to change its ways. The country’s “lost decade” is giving way, in the minds of some, to a second lost decade. The Land of the Rising Sun looks increasingly like a sunset country. Or does it? 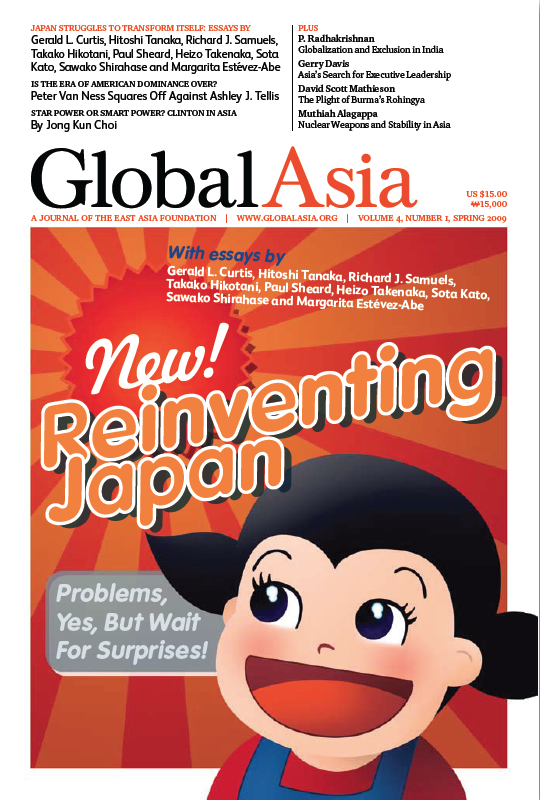 In our remarkable package of cover stories in this issue of Global Asia, “Reinventing Japan,” we examine the many pressures for change that Japan faces — from social inequality, the need for political, economic and foreign policy reforms to the role of the military. Noted Japan specialist Gerald L. Curtis served as Guest Editor for our cover package, and assembled a distinguished team of scholars to delve deeply into the transformations taking place in Japan. Their conclusions — while not whitewashing the obstacles that lie ahead — are broadly encouraging for several reasons: They highlight the vigorous intellectual debate that is taking place in Japan across a broad range of issues; and they suggest that change is, indeed, taking place. The end result is that Japan, to the surprise of many, will likely emerge from the transitional period that began in the early 1990s with a stronger, more vibrant society, political system and economy than it had before the bubble economy burst. As Curtis says in his introduction to the cover package (see page 8), “The image of Japan as unchanging has never been as inappropriate as it is today. Japan is going through a great transfor-mation, comparable to the periods following the Meiji Restoration of 1868 and the end of World War II. It took about 20 years to consolidate each of those two previous transformations.” He predicts that sometime around 2015, the full effects of Japan’s current transformation will take the world by surprise. Elsewhere in this issue of Global Asia, we debate whether the global response to eight years of George W. Bush’s foreign policies has triggered an end to the era of American dominance, or whether US hegemony can be maintained. We examine US Secretary of State Hillary Clinton’s recent trip to Asia and ask whether it really signals a change in US attitudes and actions in the region; we look at how globalization may be exacerbating India’s Hindu caste-based system of social exclusion; we explore one of the toughest challenges facing Asian companies as they become global — the shortage of executive leadership talent; we delve into the tragic plight of Burma’s Rohingya Muslim minority, and ask why the world seems unwilling to respond; and finally, we provide an excerpt from a new book that provides a surprising argument in favor of the role nuclear weapons are playing in maintaining security and stability in Asia. The latest issue features an in-depth examination of the ways that Japan’s political, social, economic and security policies are poised to transform a country that in recent years has often been seen as gripped by paralysis and overshadowed by the rise of China. With the bursting of the economic bubble in the early 1990s, the needs of younger, working Japanese have become increasingly apparent. Margarita Estévez-Abe demonstrates that it took important electoral reform for these younger voices to be heard. For decades, Japan was described as an “all-middle-class society,” a characterization that was always open to skeptical analysis. Both reformers and conservatives seem disappointed by the profound changes altering Japan's political and economic landscape. What both overlook, argues Japanese political scientist Sota Kato, is that the fruits of change require time. One of the great ironies of the current financial crisis is that US policymakers appear to have learned key lessons from Japan's failures to deal with its financial crisis of the early 1990s. As the world struggles to cope with the effects of the financial crisis, policymakers would be advised to look at the experiences of Japan during its crisis of the 1990s. Heizo Takenaka argues there are important lessons on what to do, and what not to do. Japan's Changing Civil-Military Relations: From Containment to Re-engagement? Japan's relationship to its post-WWII past and the role of its military has been problematic. Takako Hikotani looks at the changes under way in Japan that are reshaping the interaction between political leaders and the country’s Self Defense Forces. The US-Japan alliance has been at the center of stability in East Asia in the post-World War II era. But that alliance must now be open to change, if Washington and Tokyo are to enable new, emerging power balances in the region. With the ongoing rise of China and India, combined with a new president in Washington, Japan is poised to rethink its leadership role in Asia. Japan's former Deputy Minister of Foreign Affairs, Hitoshi Tanaka, lays out the challenges facing the country. New problems of social inequality, the urgency of responding to the rise of China and the desire to create new political institutions and embrace new economic policies are all on Japan's agenda. The Debate: Is the Era of American Dominance Over? The principal task facing the new US administration is to consolidate US hegemony by redefining the nation's global role, renewing its strength, and recovering its legitimacy. Under George W. Bush, the US militarized its response to the attacks of Sept. 11, 2001. With its moral legitimacy eroded, there are signs the era of US dominance may be at an end. The emergence of Asian companies on the global stage, competing with their counterparts in this region and elsewhere in the world, has exposed a new arena of competition: the battle for top management talent. Burma's Rohingya Muslim minority may be the most blighted ethnic minority in Asia. The blame for treating them so badly is shared far and wide. But as David Scott Mathieson writes, their plight has long been known to the international community. The concept of social exclusion in India dates back more than three millennia, enforced by the Hindu caste system. Modern India, though, now faces a fresh challenge to its efforts to stamp out institutionalized social exclusion. Not since Dean Rusk in the 1960s has a US Secretary of State chosen Asia for a first foreign trip. So Hillary Clinton's recent visit to Japan, South Korea, China and Indonesia raised eyebrows and expectations.